​Day 19. Friesenberghaus – Lizumer Hut. Winterday in August. We were settled for a long hiking day, getting up at 6am. Once we are ready however it starts to snow. 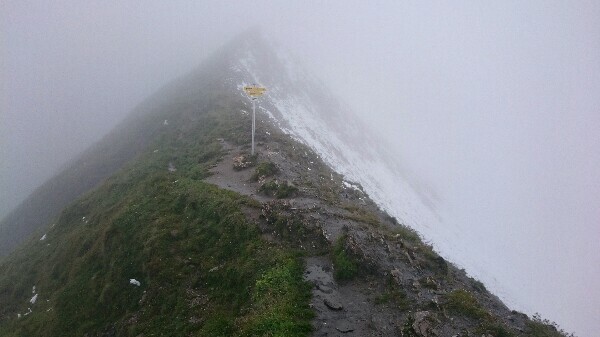 It was already foggy, but the difficult Friesenbergscharte with some ferrata sections cannot be done if wet (plus snow plus cold). Its a hard but the only viable decision for our level of skills and equipment. 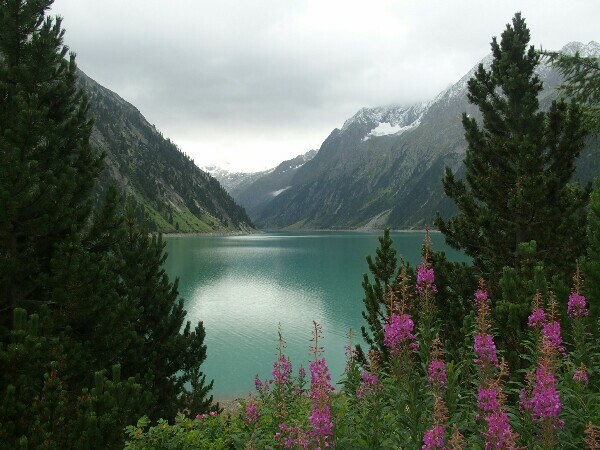 We quickly check the alternatives, as there is no other way to the other side of the mountains, we need to hike down to the artificial lake Schlegeisspeicher. It takes us 90minutes instead of 2h as we want to catch the bus at 9am. The bus brings us to Mayerhofen and is very expensive as we have to pay a toll for crossing a long tunnel. At least the bus driver is nice and tells us where to change for the bus to Hintertux (which is already waiting for us). A good hour later we arrive at the cable cars. I feel very tired and in a bad mood. I don’t especially want to get back up into the mountains with the fog and snow. I feel more like taking a nice hotel with spa and just relax one day! The decision is however to take the cable car back up into the mountains, direction of the Tuxer glacier (at least after taking a coffee and buying chocolate and some “Laugenbrötchen” which I missed a lot in Italy). Expensive seven minutes. Overall the detour of the Friesenbergscharte costs for us two about 40€ for bus and cable car plus the food! Then a half hour fast hike to the Tuxer Joch hut. From there we need to hurry up as it’s already 12h and the trail supposedly 5-6h at least. We hike in the rain up and endless, grass covered mountain in serpentines. I am wet and cold and feel far too tired for hiking. Finally it gets a little less steep but the we arrive at the first notch, on the other side everything is covered in snow. We continue to hike down and up and down and up in the snow and cold. The fog prevents us from seeing anything and my mood couldn’t be worse! We are now getting into the military zone where we aren’t allowed to leave the trail. There is a huge area where there are still trainings and days where access is closed for training shootings. 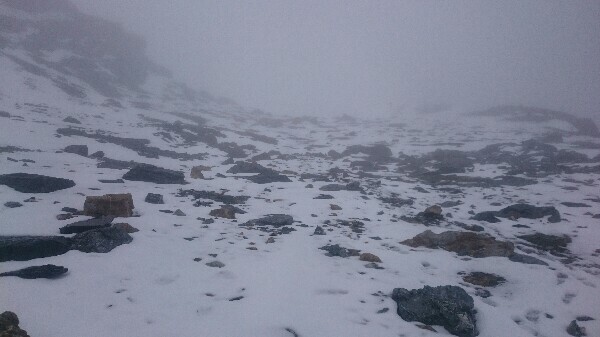 Unbelievable what happens in these beautiful mountains (OK at that moment I cannot even see them but hate them). The snowy part ends but more effort is needed. The last part is difficult to navigate and we get lost several times. My feet are completely wet and I just want this day to be over. At 4pm we are at the hut already (even though the winter hell felt so much longer!). The Hut is clean and warm and a warm shower costs only 2€ for four minutes plus the, have a drying room. After the shower I just lay on my mattress (luckily the dormitory is only half full) and read and relax until it’s time for dinner. I am wondering how I will be surviving my four months hiking in new Zealand if I am already easily upset now after 2 months of hiking… Luckily I have some time in between to recover. 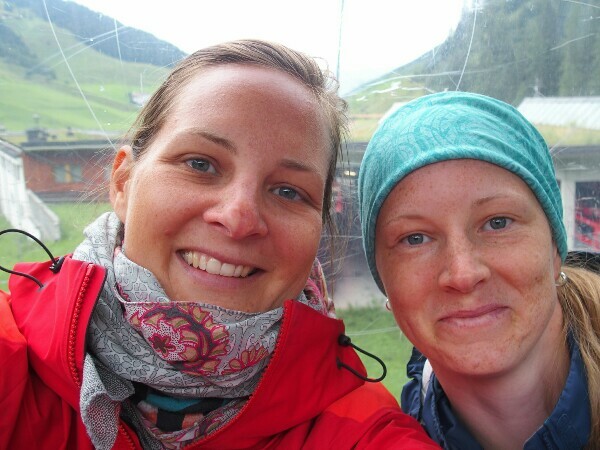 Previous Post Pfunders – Pfitscher Joch – Friesenberghaus. Snow! Next Post ​Day 20. Lizumer Hut – Tulfeinalm. Sun and climbing!